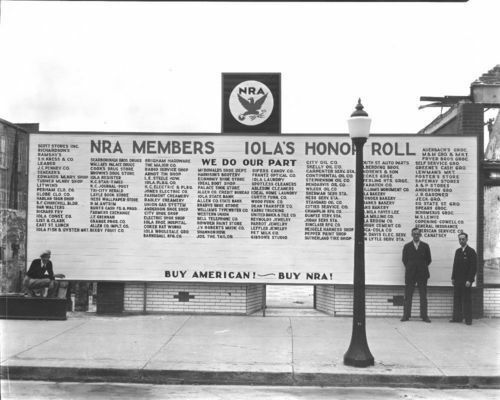 This black and white photograph shows an honor roll of names from the National Recovery Administration Program in Iola, Kansas. The National Recovery Administration, a federal program created during the first hundred days of President Franklin D. Roosevelt's administration, encouraged industrial recovery through the "codes of fair competition." At least 541codes were developed during the existence of the NRA program. Some of the codes established the minimum wage, and the maximum hours in a workweek. The NRA was a voluntary program and for business who accepted the codes, the NRA blue eagle was a symbol of participation. Government and Politics - Federal Government - Presidents - Roosevelt, Franklin D.
People - Notable People - Roosevelt, Franklin D.